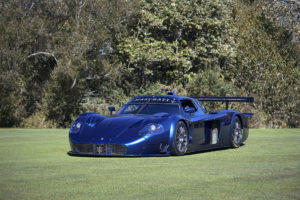 Designed to win races, the Maserati MC12 is actually sold as a road car, albeit it a very impractical one. Still what do you expect with a 620 bhp exotic car? The car looks just like the sports racing car that it is. To be fair, it is a real two-seater while the cars that race at Le Mans are more like single-seaters. Only 25 MC12s were built initially, and quite a few were used for racing. 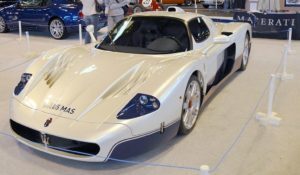 Actually, when they heard about Maserati building the MC12 for the GTA championship (ooops, sorry for sale as a road car, was the official line, I think) some of the other companies threatened to withdraw as they thought the presence of the MC12 on the starting grid would make a farce of the whole series. Although the Maserati MC12, is a true exotic car, it is based on the Ferrari Enzo. The whole idea was to upgrade Maserati’s image following a checkered history. The glory of the 50s, when Maserati was a regular winner of Grand Prix, got lost in the mire of an economic downturn, when the company took the wrong turn more than once. As Ferrari and Maserati are both part of the Fiat Group, and were in fact in the same sub-group, it made sense to modify the Enzo to get Maserati back as a winner. Now, Ferrari and Maserati have been put in different sub-groups, so this sort of collaboration is not expected in the future. The Maserati MC12 looks completeley different from the Enzo, though,, with a long nose and very long tail. Where the Enzo is angular, the MC12 is curved. It has a carbon fiber body structure with steel sub-frames front and rear. Power comes from a 6.0 liter V-12 developing 622 bhp @ 7,500 rpm, and 480 lb ft (652 Nm) torque @ 5,500 rpm. A semi-racing engine to be sure. It is coupled to a semi-automatic six-speed sequential gearbox, developed by Ferrari in racing. Suspension is by double wishbones, with inboard spring and damper units acting through pushrods. These are mounted horizontally as on the Enzo. The dampers have variable rates. Quite a car, but not as extreme as the Bugatti Veyron or the latest Saleen S7. Following the racing success of the MC12, Maserati is now to build a more extreme version – the MC12 Corsa. The MC12 Corsa has a massively uprated Enzo V-12 engine giving about 750bhp. You can get this for about $1.3 million – or £700,000 or Euros 1 million depending where you live. But this is not a road car, nor will you be able to race it in any official categories – so this is a trackday special at a huge price. Maserati plans to build about 12 MC12 Corsas a year.